GiftTree presents one of our most sought-after pairings - a bottle of Silver Oak Napa Valley Cabernet Sauvignon arrives with two Vinum XL glasses from the most renowned wine glassmaker in the world, Riedel. With chocolates and a wine key, this is an opulent gift. Boasting a gorgeous garnet purple color, Silver Oak Napa Valley Cabernet opens with aromas of blackberry liqueur and nutmeg, indicative of the American Oak aging. On the palate, the wine opens to reveal flavors of deep black fruits, raspberry and sage, with a long, lingering finish. One bottle of Silver Oak Napa Valley Cabernet Sauvignon. Two Riedel Vinum XL Wine Glasses. Stainless Steel Wine Key, Pewter Cork Keeper. This fine wine gift is presented in our signature wine crate. A complimentary note card bearing your personal message or greeting is included with your gift. Measures 14" x 12" x 4". Silver Oak Napa Cabernet & Riedel Reserve Tasting is a hand delivered gift. These gifts are delivered by one of our local design centers located throughout the United States and Canada. Same day delivery is available for most gifts when ordered before the cutoff time. The cutoff time for Silver Oak Napa Cabernet & Riedel Reserve Tasting is 2 PM in the recipient's time zone. Silver Oak Napa Cabernet Sauvignon 2013Flavors of sage and blackberry mark Silver Oak's lush entry on the palate. The strong acidity in the mid-palate is followed by a lingering finish. Featuring Silver Oak Napa Valley Cabernet Sauvignon. 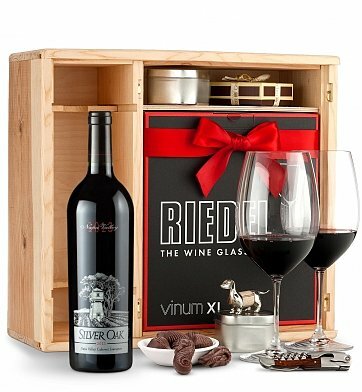 Two Riedel Vinum XL glasses, wine key, chocolates and more. Arrives presentation-ready with an attached wine card in a gift box.